SAN ANTONIO, Texas – The Hispanic Association of Colleges and Universities (HACU) will be hosting its 17th Annual Conference—“Hispanic Higher Education Success: America’s Path to the Future” October 18-21, 2003, at the Hyatt Regency Orange County in Anaheim, California. The 17th Annual Conference in Anaheim will kick-off with its first ever HACU Roast and Fundraiser on Friday, October 17, 2003 at the Hyatt Regency Orange County. The event has been developed to honor and recognize this year’s honoree, Dr. Tomás A. Arciniega, President of California State University – Bakersfield, who has announced his retirement on July 1, 2004. “From California to Capitol Hill, Dr. Arciniega has proven a compelling advocate for the higher education needs of the nation’s youngest and largest ethnic population. His remarkable achievements have opened countless new doors to college and career success for Hispanic students everywhere,” said Flores. The net proceeds from this event will go to support a scholarship in the honoree’s name and HACU’s work. The four-day conference is expected to attract more than 1,000 leaders from higher education, corporate, government, philanthropic, public policy and community ranks, as well as hundreds of top Hispanic higher education student leaders. Other objectives include developing collegial networks among faculty, administrators, and federal and corporate representatives and highlighting the best and most promising collaborative practices in higher education nationally and globally. A variety of important workshops on empowering Latinos, student success and the role of Hispanics in international affairs will be featured promoting education excellence and equity. The conference will also include compelling presentations of national interest and provide unique networking and partnership opportunities spanning the public and private sector. A Career Fair will offer students, faculty and other conference attendees the opportunity to meet representatives of leading employers, education services, grant and scholarship providers, and others. For more information, contact HACU Director of Communications Daniel Casillas at HACU national headquarters in San Antonio, Texas, at (210) 692-3805. Ext. 3249 (dcasillas@hacu.net). 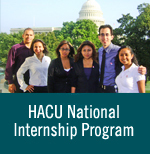 Or visit www.hacu.net.